WE’VE LONG BEEN fond of AOC’s huge 31.5in AG322QCX gaming monitor, but a few flaws have always niggled; notably, the somewhat sluggish response time and distracting inverse ghosting with Overdrive acceleration enabled. 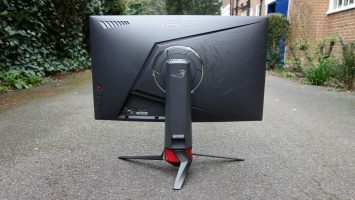 Now it has a competitor, in the shape of the Asus ROG Strix XG32VQ: a QHD display that’s similarly priced, and just as big, but which promises a faster response time and some flashy ornamental touches. 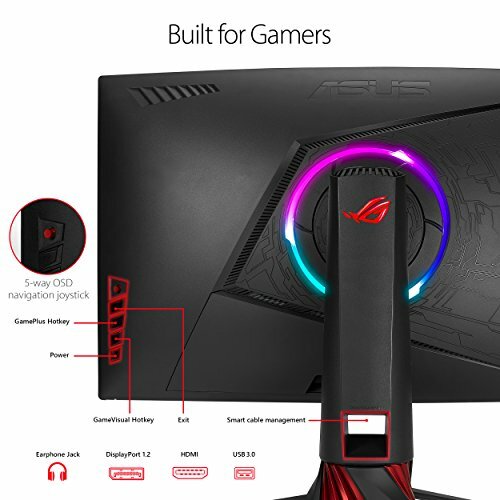 The ROG Strix XG32VQ is a 31.5in widescreen gaming monitor with a native resolution of 2,560×1,440. 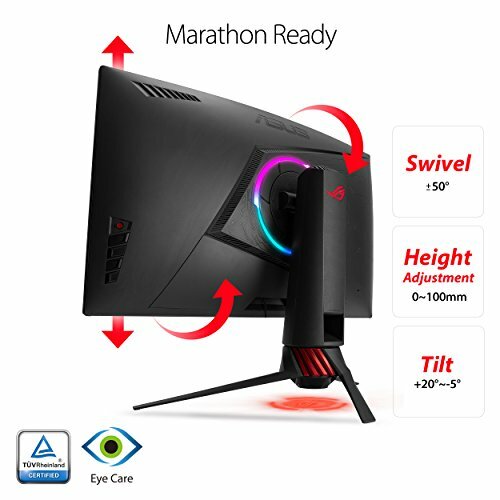 Its curved VA panel delivers vivid colours with fast response times, and supports refresh rates up to 144Hz, with Adaptive-Sync technology to keep things perfectly smooth. 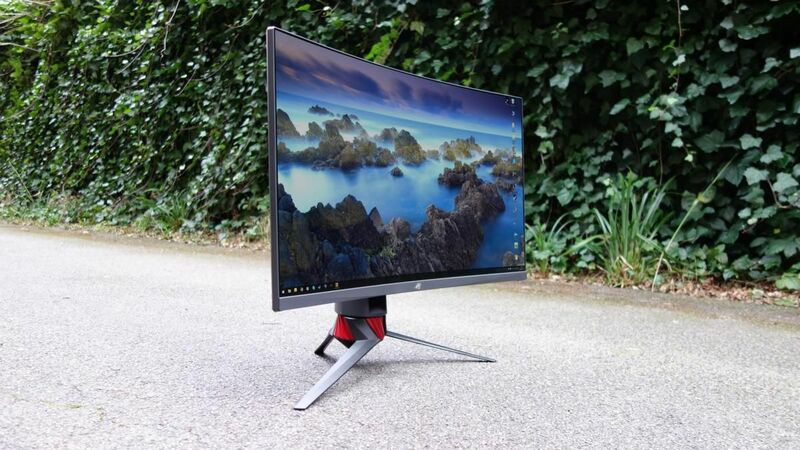 The first thing you’ll notice about the XG32VQ is the distinctive stand. Its chunky rotary base is redolent of a plane’s propeller; it’s practical, though, allowing the screen to tilt (-5° to 20°) and swivel (-50° to 50°), and has a 100mm height adjustment range. It’s also flashy, with a beaming red light that projects an ROG logo on to your desk. This can be replaced with a logo of your own; included in the box is a blank cover, essentially a piece of clear acrylic on which you can draw whatever you like. If you find it distracting, it can be disabled through the OSD. 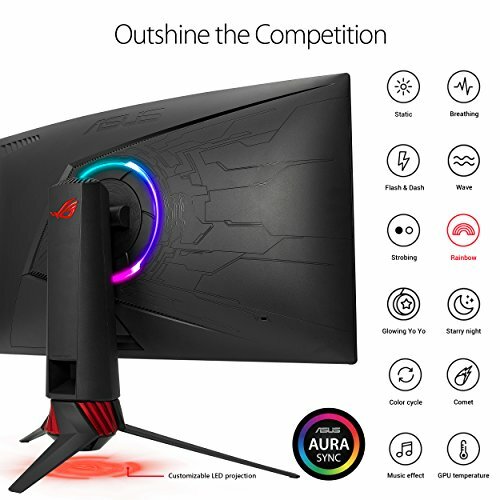 There’s also a circular RGB strip on the rear that works with Asus’s Aura Sync software, so it can be synchronised with other Asus peripherals and components, such as keyboards, mice, motherboards and graphics cards. Since it faces the rear, however, you won’t see it yourself while you’re gaming – it’s only good for showing off to others. Also on the rear are a joystick and four buttons for controlling the monitor’s OSD: an excellent design choice, as it makes interacting with the monitor effortless. As for connectivity, there’s HDMI, DisplayPort and Mini DisplayPort 1.2, plus a 3.5mm headphone jack and two USB3 ports. 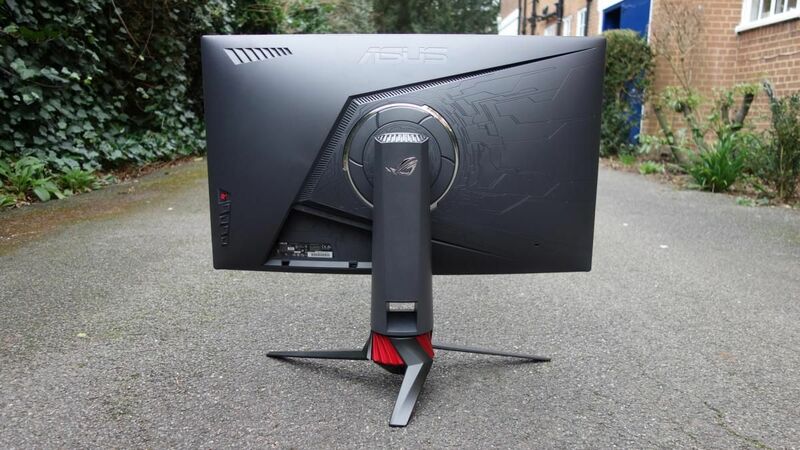 From the front, the XG32VQ looks great, with a three-sided borderless design and a 1,800R curvature. This creates an immersive experience, with no distractingly large bezels. 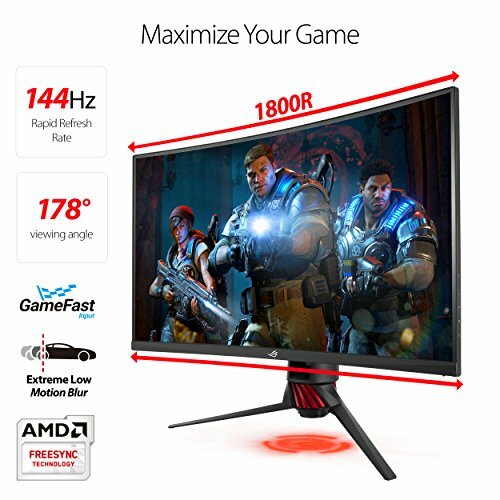 What’s more, since the monitor supports Adaptive-Sync technology – an offshoot of AMD’s FreeSync – you can enjoy tear-free gaming with any compatible AMD graphics card. If you’re using an Nvidia GPU, you can still use the monitor in 1440p at 144Hz, but to eliminate tearing you’ll have to rely on Nvidia’s Adaptive V-Sync technology instead, which increases the input lag. The XG32VQ’s 31.5in VA panel has a native resolution of 2,560×1,440 and runs at 144Hz. Despite its size, this isn’t an ultrawide monitor, but conforms to the familiar 16:9 aspect ratio. While the display looks vivid, you might immediately notice that it’s not as bright as some of its rivals. Our i1 Display Pro calibrator measured a peak luminance of 248cd/m2, while enabling sRGB mode drops this to 185cd/m2. The AOC AG322QCX is around 50 cd/m2 brighter in both modes, and the difference is definitely perceptible. On the plus side, overall brightness uniformity is surprisingly good across the panel’s surface. 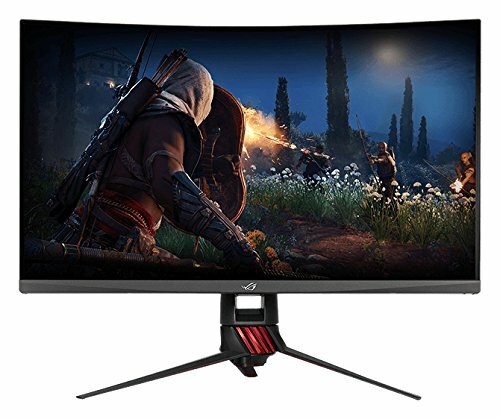 With no more than -11% variance from the centre, the panel competes with professional-level monitors, which is not something that can normally be said for a gaming display. The Asus covers an impressive 98.1% of the sRGB gamut. However, colour accuracy isn’t great, with an average delta-E of 3.29 and maximum of 7.94; the AG322QCX attained scores of 1.03 and 3.94 respectively, making it a better choice for media editing. 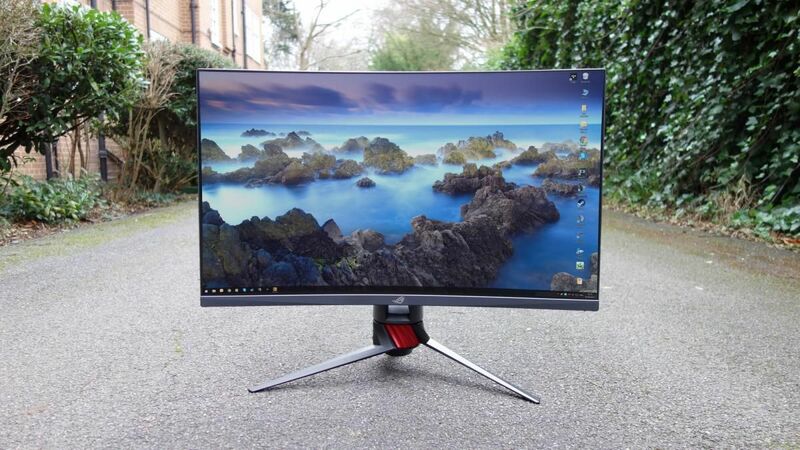 The Asus’s contrast ratio of 1,773:1 also doesn’t quite match the 2,002:1 contrast ratio of the AOC monitor, but that’s less of an issue, as it’s still perfectly strong enough to produce bold, striking scenes. One of our criticisms of the AOC AG322QCX was its slow response time. That isn’t a problem with the ROG Strix XG32VQ; in our tests, we found the monitor responded very well, with minimal perceptible input lag. Be aware that this was achieved with Overdrive set to Level 4 in the OSD. Turn it up to the maximum Level 5 and inverse ghosting becomes visible, without any noticeable improvement in performance. The other thing to consider is that you’ll need a high-end graphics card to get the full 144Hz refresh rate at the monitor’s native 1440p resolution. If you have a lesser card games should still run smoothly, thanks to Adaptive-Sync, but you won’t be experiencing everything the ROG Strix XG32VQ has to offer. Asus’s ROG Strix XG32VQ is slightly dearer than its AOC rival, but it’s not as bright and doesn’t have the same level of colour accuracy. In games, the more responsive panel and low input lag will more than make up for those shortcomings. While the RGB lighting doesn’t add much, the ROG Strix XG32VQ is our new favourite 31.5in gaming monitor.